With one of the biggest (American) football games coming up in nearly two weeks, I thought I’d do something a little fun in honor of that. Seeing as how I have several decades of music knowledge to go on and the 90’s were essentially where my complete love of music was born I thought I’d take a little gem from that time frame and use it as the theme for this entry. While I already had my look already figured out, it was more of a challenge of what I was going to do to surround myself with the atmosphere of what one might consider a “jock” culture which if I’m not mistaken is still a thing today. Football players are highly regarded and sought after within their respective classes and adored by cheerleaders and other girls alike. It was either going to be that I looked around to find bits and pieces to make a build myself which I am self-assured is not my forte…or I could try to find a backdrop that would befit my vision. 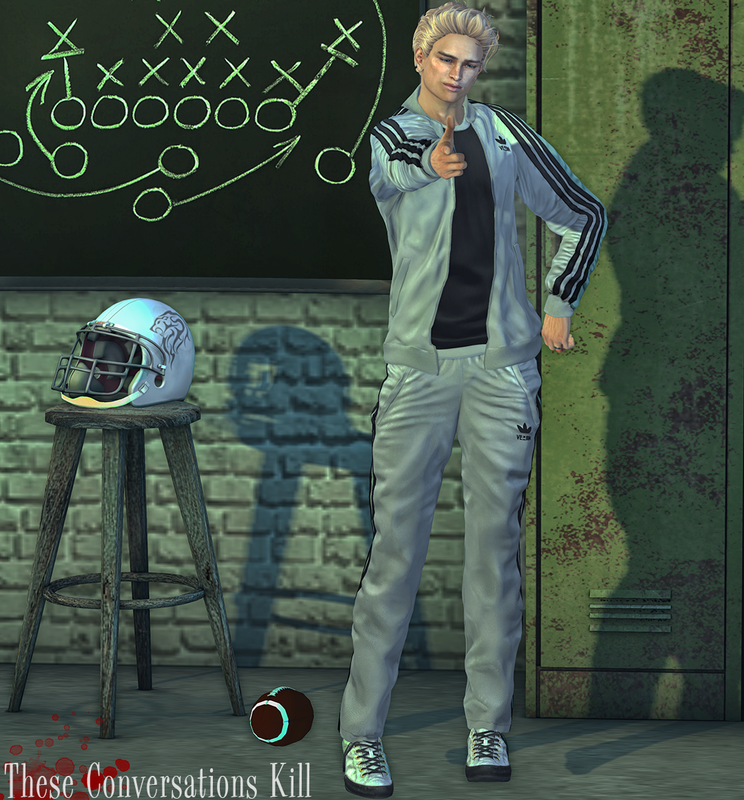 All it really took was a quick trip onto the marketplace where I found the awesome locker room backdrop from RAMVII (which I admit was perfect for what I had rattling around in my head). The finishing touches were the football helmet from Tartessos Arts and the football that you see which is from a pose set from NANTRA’S “Touchdown” pack (which I will link for you because I did not credit it due to it being a part of a set I did not use in this blog post). After I put this look together and was had my song choice picked my wife thought I was going with a basketball theme because of the track suit; I explained to her what I was doing and she said I looked more like a basketball player. While that may be true I distinctly remember during my time in school that all the football players wore track suits during the school assemblies. Regardless of whichever one of us is right I may have to purchase this outfit in another color and do a basketball pic just for the fun of it. Image Essentials has released a new pose set called “Lightbulb Moment” and while it is intended for use by the ladies, I managed to make it work using some out of the box thinking as I’ve been known to employ from time to time. This pose set is available at the Designer Circle event through the 3rd of February. For the second consecutive entry I am featuring a product from Modulus but this time it is the latest skin in the M-Bare line that is a mainstore release. “McMillan” is his name and he appears to be a confident fella as I’ve portrayed him in these photos. I’ll talk more about this guy down in the credits so I don’t run out of things to say. I feel like I did a fairly good job of putting a look together to capture the essence of “Johnny Football Hero” as the lyrics in the song suggest. One of the things that I try to do more than anything is to make my avatar look and feel the part of whatever vision my brain comes up with for me to conceptualize. Within the next blog entry or so I am going to be featuring Modulus, Go&See and some items from The Epiphany event which I’m looking super forward to and hope that the final touches are exactly what I thought up in my head. The next adventure is just up ahead and I’m looking forward to seeing where it takes me. I picked up the Fifty Linden Friday version of this hair with a mix of colors combined (like a smaller version of a variety pack). There are several color packs to choose from as well as a variety and FATPACK for those who tend to wear several colors of hair and want to stick to one hairstyle for a while. Now known as just Wasabi (previously known as Wasabi Pills), I feel as though I was not as thrilled with this purchase as I originally thought but is at least worth the price I purchased it for during FLF. With that said, what is not as good for one may be better for another and I do not want dissuade anyone from trying it out for themselves before making their decision. The newest confident male skin in Modulus’ M-Bare line is as I mentioned before a store only new release. It comes in three tones (Latte, Rose, and Sand) and includes a brow and body shape to make it look its best and as how the creator intended; along with a HUD that gives you the option to apply just the face or individual (or combined) hairbase and brows. The skin appliers can be found at the mainstore for all current body types to ensure compatiblity. Track jackets have been a part of sports culture for as long as I can remember and it’s trickled down to what most guys wear to relax or go to the gym in (for those who work out). The track jacket comes with an attachable shirt with a HUD that can change the color/texture of the shirt. I find this to be very fashionable and could even be paired with jeans if you are not feeling quite like putting the whole track suit look together. ℭ𝔬𝔪𝔭𝔞𝔱𝔦𝔟𝔩𝔢 𝔚𝔦𝔱𝔥: Belleza and Signature male bodies. 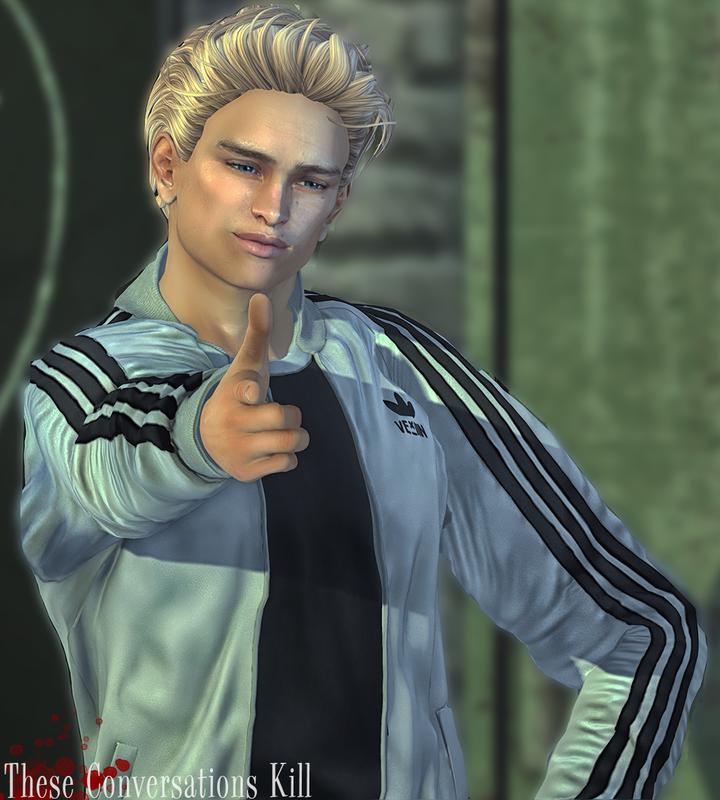 The second half of the track suit ensemble, these pants have an option where you can wear boxers (which you cannot see in the pictures as I am wearing the jacket). An included HUD allows you to change the color of the boxer with several color/texture options. I really love the quality of these pants and as a fan of track pants because of their comfort when you don’t want to be in adult mode, these are just what any man could ask for as far as chill apparel goes. These shoes appear for the second straight entry as I felt that they were perfect for this look as they are sporty type shoes. I just colored them appropriately to match the colors of the track suit. I found this backdrop while scouring the marketplace for items that would help me in setting up a scene. There are not many items in the store but the mesh really seems to be made with quality and this backdrop’s textures are pretty good as well. The chalkboard can be edited to allow you to place your own picture inside at your discretion. This pose set includes 5 different poses (each with mirror poses) and is bento enabled so if you do not have a body or hands that have it, they will not work. These poses promote the idea that the person posing has come up with a thought or idea and I can see people doing these kind of poses in everyday life. As previously stated, these poses are female oriented but can be used by males due to the parity of them.